Engage in the true spirit of celebration with this Outstanding Electric Rice Cooker PRWCS 1.8 of Prestige Delight of 700 Watts Power that instantly uplifts the mood. This is an exciting range of Electric Cookers that not only cook rice but an entire menu. This Cook Porridge, Soup, Stew, Pulao, Idlis, Steam Vegetables in a convenient and hassle free way. 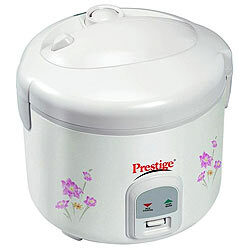 With features like speed cooking, keep warm etc., Prestige Rice cooker is an indispensable kitchen appliance to own. It also includes chief features like Non-Stick Cooking Pan, Detachable Power Cord,Condensation Coup, Steamer Basket, Strong body. It comes with One year warranty.